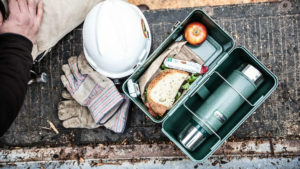 A great lunch box for construction workers will protect your lunch from getting ruined and keep it fresh while you work. It should be sturdy, durable, and last you for years. This article will help you decide on the best cooler for your long days at work. Many construction workers simply leave their job site at lunch time to go through a drive-through. As soon as they drive to the fast food restaurant, wait for their lunch, and get back to work, they are so short on time they have to eat as fast as they can. A lunch box with an already-prepared meal can eliminate this stress and also keep you healthier in the long run. Bringing your lunch to work at your construction job in a paper bag one time is enough to prove that a stronger container is necessary. By noon, your sandwiches will be squashed flat and your bag may even have dirt or cement in it. If you’ve already made this mistake, you know how important a quality adult lunch box is. If you haven’t, you can prevent it by purchasing one. Another good reason to pick a good lunch box is the danger zone in food temperatures. Bacteria can grow very quickly if your food doesn’t stay cool, increasing your risk of illness. If you pick the right choice, your lunch box can keep your food safe from this risk. Below, we will cover some of the best lunch boxes available on the market that are suitable for construction workers. Each of the lunch boxes on this list was selected for its quality, ability to keep food safe from harm, and convenience of design based on user reviews. You will find a variety of sizes and designs on this list. If you only need a small cooler to keep your lunch fresh and cool all day, the Stanley 7QT Heritage Cooler is a good choice. It comes with a convenient feature on the handle and lid that allows you to lock a Stanley thermos in (included with the purchase). 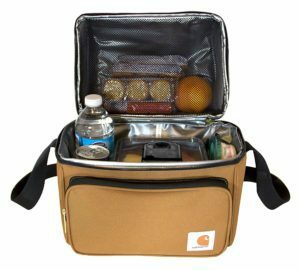 The cooler is insulated with foam to keep the inside cold and the inside has different storage compartments for separating your lunch items. This product is made from plastic, comes in a dark green color, and has a lid that can also work as an eating surface. If you’re done having rushed fast food lunches or using coolers that require buckets of ice, this will be a very welcome change. The thermos that comes with this product will keep your beverages either cold or hot. 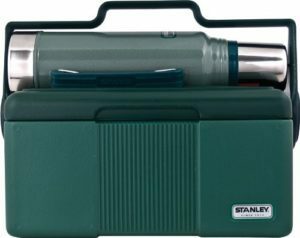 What’s great about the Stanley 7QT Heritage Cooler is that it’s not too big. For a construction worker who needs to carry a bunch of tools to work, a smaller cooler is best. You won’t have to make countless trips back and forth between the garage and your truck in the morning this way. Both the handle and lid are solid and durable so you don’t have to worry about breaking it on the way. When you are deciding which lunch box to choose for work, you may want to consider how long you need to keep your food cool. With this Stanley Heritage Cooler, you can expect the cooling effect to last between 12 and 18 hours. If you need something to take on multiple-day hiking treks, you may want to consider something else. Some users may find that this cooler is too small, but if you weigh between 180 and 280 pounds, it should have plenty of room for your lunch. The lunch box works well with frozen reusable ice packs, which are affordable and convenient. You can fit a full-sized sandwich, one banana, some carrot sticks, a granola bar, small bag of chips, and more, along with two ice packs. 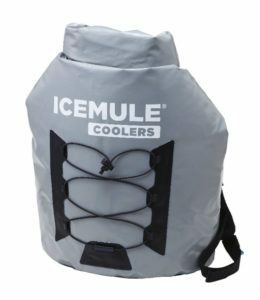 If your workdays are a little on the rougher side, a tough cooler like this IceMule Pro Cooler could be exactly what you need. These coolers are leak-proof and versatile, combining the efficiency of a hard lunch box with the portable convenience of a backpack. These coolers are now made with improved, new materials and are built to offer tough, high performance on the job. This reliable lunch box comes with five different methods for providing superior insulation. It has a foolproof seal for keeping warm air out and ice in, tough outer and inner layers, twice the thickness of other soft coolers, and another insulation layer that keeps your food cool for up to a full day. In addition, you’ll find an air valve that removes air from the insulation layer, ventilated back pads, and reinforced back straps that will keep you comfortable if you need to carry it around. The cooler is large and measures 11 inches deep, 14 inches wide, and 17 inches tall when closed. It can even hold 18 cans, plus ice! For those who need a great lunch box for work, plus a cooler that can handle long hiking excursions, this is the ideal selection. When you aren’t using the cooler, it will store flat instead of taking up a lot of room. Even those who would have a hard time carrying this lunch box fully loaded with their arms will have an easy time transporting this on their back. It will stay looking brand new, even with constant use and can be taken hiking and boating. It will stay cool, no matter the temperature outside. Not only does it keep ice in and air out, but it’s waterproof. It’s also a decent price for what it offers, for those on a budget. For a heavy-duty choice that will last and last, consider this Carhartt Gear 358100B lunch box. It’s a nice, quality-made bag with durable outer material and zippers. The top can be used to store a bottle of water and an 18oz thermos. Some users may not like the mesh in the top and could find that the liner isn’t as substantial as other brands, however. You could use the top pouch of this lunch box for storing a dessert and chips so they stay intact instead of getting squished. If you’re ready to stop using paper or plastic grocery bags for your work lunch, this upgrade will keep your food cold all day long. 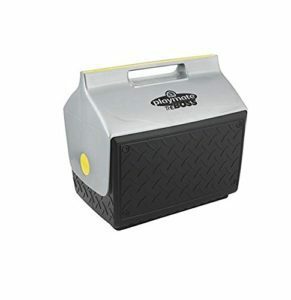 The unisex cooler is well-insulated, repels water effectively, and will protect your food from getting smashed at work. The main compartment is built to keep your food safe from dangerous temperatures, even when you’re working outside in the heat. There is a separate top section for separating different lunch items, along with a zippered pocket in the front. It has a top handle and shoulder strap for an easy carrying experience. You can also use this as a cooler for beverages on the weekend as it will hold up to six bottles or cans. The lunch box measures 7 by 9 by 10 inches and is perfect for those who would prefer not to carry a hard plastic cooler to work. If you like the Carhartt brand, you’ll be happy that this lunch box stays true to their typical color schemes. For a rugged choice that will keep your lunch cold day after day and stand the test of time, try the Klein 17-Quart Tradesman Pro. It can be kept in your car, even in hot temperatures, and will still keep your lunch and beverages the perfect temperature. The cooler is large enough to accommodate 1-liter water bottles, but only if they are lying down. Durable and sturdy, you will be able to fit everything you need in here along with up to three frozen ice packs. Perfect for keeping your food and drinks cold during a full work day, it also works for longer excursions, like camping or hiking, as it will keep drinks cold for up to 24 hours at a time. The small inner storage space is convenient but better for snacks than your sandwich or other bigger items, as it’s not large enough to hold those. Note that although the lid has a great seal on it that keeps ice for hours, it also pops open easily, so make sure you keep it stable when it’s in your car. The handle of this cooler is very well-made and has a big belt made of nylon for carrying, with metal hooks added to lend the plastic extra durability. It’s clear that this product was crafted with quality in mind. If you live in a hot climate and have to keep your lunch box in your car or truck all day long, but still want to have a nice, cool lunch, this is the choice for you. Even in extreme temperatures and locked inside a vehicle, this cooler will do the job. It comes with a lock function at the front for safety, though some users may find that it could do with some extra mesh on the outside for storage. This is a high-quality lunch box for construction workers that costs a fraction of what other brands are charging. 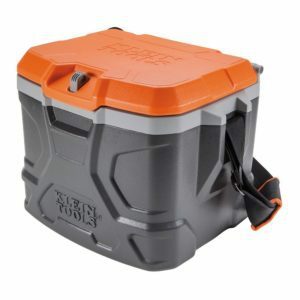 For construction workers who require more space for their lunch, the Igloo 14.8 Quart Playmate will do the job. Going back to a classic look, this lunch box just might take you back to your childhood days. The cooler has a sleek design with a black and silver color theme and a textured outside surface. For construction workers who have job sites in very hot places, this choice is perfect for holding multiple bottles of water and keeping them cold. The easy-open lid allows for quick access to your food or drinks when you’re in a hurry. Store it in your car without worrying about your lunch getting too hot. This also works well for camping or hiking excursions, in addition to holding your work lunch. A cooler this big is also great for those who bring their lunch to work in many separate Tupperware containers, which tend to take up a lot of room. Note, however, that some users have reported the cooler leaks when it’s on its side, so try to keep it upright in your car or work truck. Using Frozen Ice Packs: Using at least one ice pack is recommended for cooling down the temperature of your lunch cooler, but the more, the better. Keep in mind that they must be actually frozen and not just cold. Keep them in the freezer overnight, every night, to ensure this. Not only will your food stay fresher, but it will taste better, too. Freeze your Water Bottle: Although it won’t work as a substitute ice pack, having a frozen water bottle in your lunch box will also keep the temperature down over all inside of it. In addition, your water will be much more refreshing when it’s time to take your lunch break. A reusable bottle will handle freezing better and save you time and money. Use Stainless Steel: You can purchase stainless steel containers for your lunch instead of using plastic Tupperware or bags. These can be kept in the freezer before you pack your lunch. Just make sure that the metal is safe for the freezer before you use them and they will help keep your food cool all day. Store your Cooler in your Fridge: Once your lunch has been packed, keep it in the refrigerator instead of letting it warm up before you go to work. Then you can toss in a frozen ice pack or two and head out the door. Construction isn’t the easiest job out there and if you want to get through your work days without a struggle, the right lunch will help immensely. All of the tips above will make your lunch taste better, keep you safe from illness, and help you stay focused on your tasks at work.